Starring: Robert Downey Jr, Chris Hemsworth, Mark Ruffalo, Chris Evans, Scarlett Johansson, Jeremy Renner, Samuel L. Jackson. IMDb summary: Nick Fury of S.H.I.E.L.D. 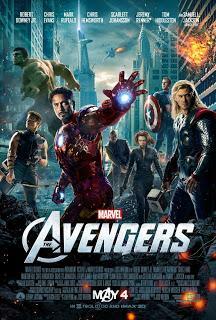 brings together a team of super humans to form The Avengers to help save the Earth from Loki and his army. There's something slightly overwhelming about seeing your favorite super heroes on screen at the same time. Its almost surreal...glorious, unbelievable. It takes repeated viewings to process the entire concept. 'The Avengers' has been in the pipelines for a few years. In fact, it's probably had one of the lengthiest introductions into the movie world, what with around 6 origin stories prior to the release. Combining all these past adventures and the large variety of characters into a two hour film was an incredibly ambitious thing to do - but Joss Whedon has done it with flair, humour, grace, spectacle and heart. This film doesn't take itself too seriously. In fact, its a barrel of laughs from start to finish. And what can one expect when so many different personalities are thrust together? In a nutshell, the one liners come thick and fast, the ridiculing, the mocking, the joking make regular appearances and the playfully antagonistic relationship between the gang is apparent from the get go. Just your ordinary, dysfunctional family, then. Of course, Robert Downey Jr's Iron Man gets the best snarky moments, particularly during his first scrap with Norse God Thor, in which he proclaims 'Doth mother know you weareth her drapes?'. However, it has to be said that The Hulk also gets some brilliantly slap stick, shining, laugh out loud moments, and deservedly so after his two previous films, which barely scraped the surface when exploring his character. A rather hysterical meeting between the green monster and Loki springs to mind as one of the greatest scenes in the film. 'The Avengers' has allowed the Hulk to be emotionally fleshed out as well as physically - Mark Ruffalo is the first actor to actually PLAY the Hulk, thanks to motion capture. Though the whole 'Loki war' plot is somewhat standard and unsurprising, one barely notices with such a strong character driven script, which eclipses any, if all, of the film's narrative faults. It becomes a feast for the eyes not simply for the breath taking action, but to see how these heroes interact with one another, because each individual essentially believes that they are the strongest...that they are the leader. 'Ego' just doesn't cover it. Also, each hero is explored equally. The remarkable thing about this film is that its incredibly well controlled, and balanced - there's a fluent quality that allows it to feel merely two minutes long rather than two hours. You get the feeling that Joss Whedon, despite being aware of the high expectations, wanted to create a faithful comic adaptation whilst still striving to make it his own. In short, it's a reliable and grounded piece of film making that DELIVERS. One should feel a large sense of satisfaction when leaving the cinema. And that final twenty minutes...phew! A mind blowing showcase of top-drawer battle escapism. The word 'epic' immediately comes to mind. 'The Avengers' is a super hero movie at its best, because it stays in touch with human emotion, whilst still maintaining that obligatory action packed block buster element. It's a truly thrilling ride with a number of memorable characters. A phenomenal introduction into what will hopefully lead to many more adventures with the world's most famous 'super secret boy band', as Mr Stark would have it.